I really don't like pastels that much. Little old ladies in twinsets and pearls. Little girls in frilly dresses and buckle shoes. Party treats and birthday cakes. I certainly don't want to look like no.1 or no. 2. Number 3, on the other hand, is not a million miles away from this outfit! The more I look at these pictures the more I realise that I'm channelling the party cake look here. Those layers of coloured sponge and the icing-like ruffle. Cake-inspired fashion aside there is also something childish about this outfit. 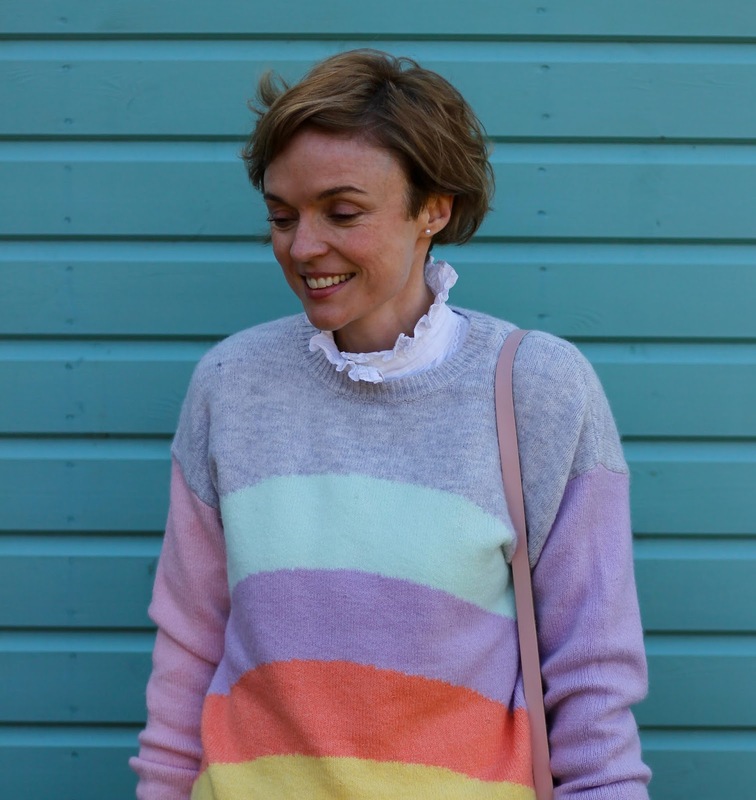 I know that I said I didn't want to look like a little girl BUT (ironically) the jumper I'm wearing is from the kids' department. I'm also digging out my old yellow trousers from 2017. I've worn them SO often since I bought them, they've been a great buy. Unfortunately, they're starting to look tired now and have lost their shape a little. However, I'm determined to get another season out of them... or two! 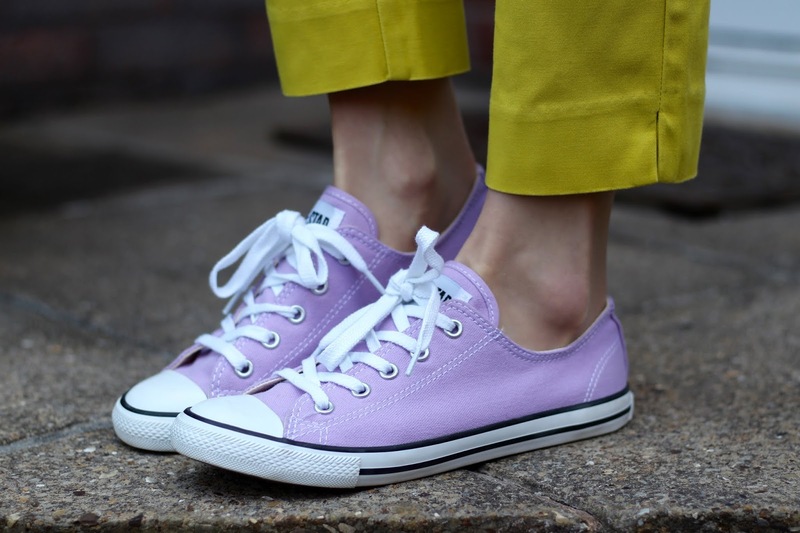 I'm also wearing a pair of lilac converse that I picked up brand new in their box at a local charity shop for a couple of pounds. 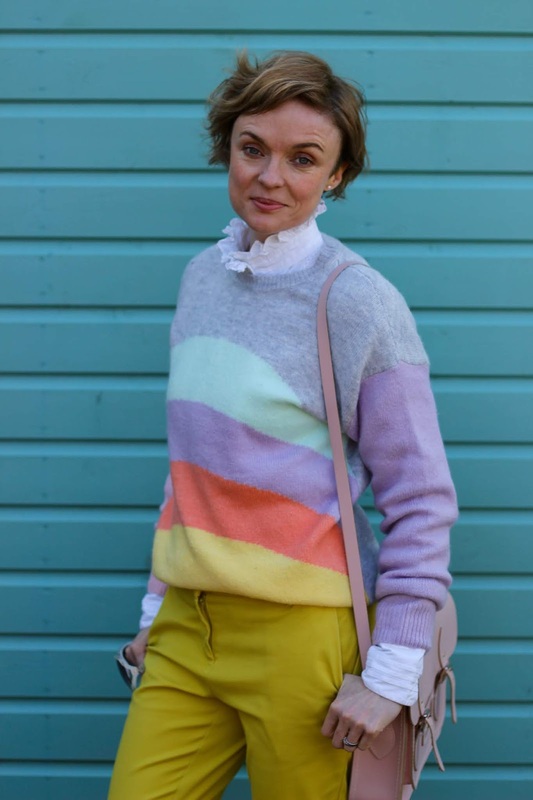 I must say at this point that cropped trousers, baggy jumpers and very flat shoes are NOT the most flattering of shapes to wear together. This combination will seriously shorten your legs. My legs are long (compared to my body) and they've still been visually chopped in half by this outfit. I'm just about getting away with it (... maybe...ish??) but it's tough. If your legs are on the shorter side, or your body is proportionally longer than your legs, avoid this unflattering combination. 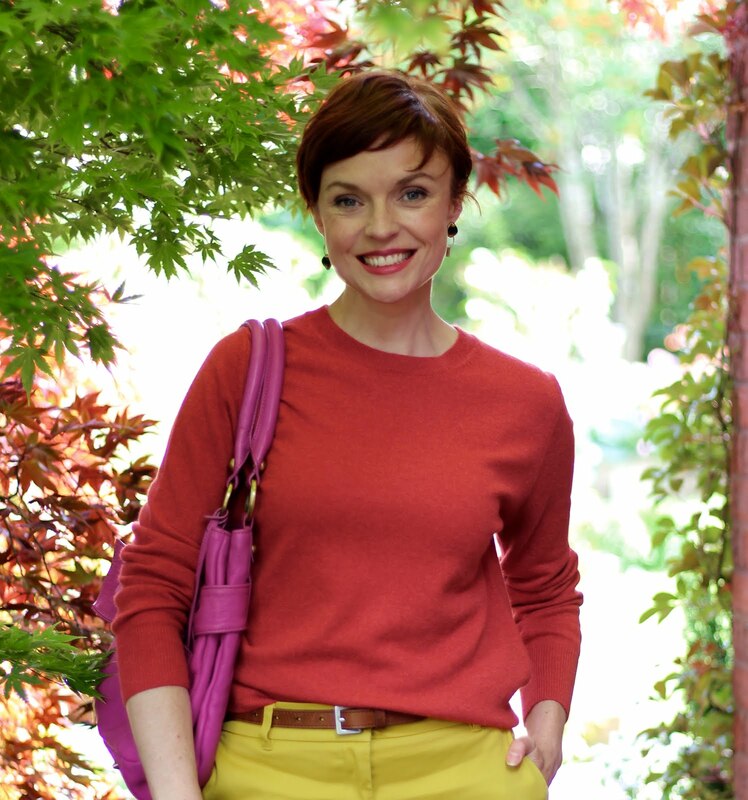 However, if you love a cropped trouser then all you need is a slight heel to give a bit of oomph and cheat a longer limb. An easy fix if you can bare it. Are you a pastel fan? Do you ever dress like a party cake or unflattering combinations like flat shoes and cropped trousers? JUMPER: the kids' department at Tesco! I think this is a good outfit. The sweet sweater and the strong cool trousers. Perfect match. I'm going to pretend like I didn't just read that YOU REMOVED SEQUINS FROM THE JUMPER!!! Fabulous outfit, honestly I totally adore everything about this. Maybe only better with sequins, hahaha! I'm loving this on you. It's funky without being OTT and and the palette suits you. Absolutely adorable and chic at the same time. I hope you saved the sequins for future bedazzling of something drab! P.S. Now I must get a pastel stripe sweater and lilac sneakers or my life will not be complete.